As your dog ages, they may begin to experience issues such as arthritis, that can cause them daily unbearable pain. Unlike humans, dogs cannot verbalize their pain, making it difficult for us to recognize they are in pain and if the pain is severe enough for medical treatment. When it comes to pain management in older dogs, it is important to first understand how to recognize when your pet is experiencing pain. Obsessive grooming. When grooming is focused on one part of the body, it could signal pain in that area. Irritability. A friendly and tolerant dog who is in pain may become aggressive or irritable. Difficulty moving. One of the first signs you may notice is that your dog is having problems standing up or sitting down which is commonly a sign of back pain. Another sign of pain could be squinting of the eyes, accompanied by heavy breathing. If you notice any of these signs, it is important to have your pet examined and establish a plan to manage your dog’s pain with your veterinarian. Weight loss. If a dog is overweight, they are putting more stress on their joints. Weight loss can help relieve the extra stress on your dog’s joints, helping to ease arthritic pain. Nutraceuticals. These supplements provide medicinal benefits along with nutritional benefits and can be used to manage conditions inflammatory conditions such as arthritis. NSAIDs. Aspirin is a common over the counter NSAID that should only be used temporarily for pain management. Prescription NSAIDs such as meloxicam are much safer for daily use. Opioids. Tramadol is a common opioid used to treat dogs for very severe pain and is often used with NSAIDs to increase its effectiveness. Opioids are not commonly prescribed due to the high abuse rate. 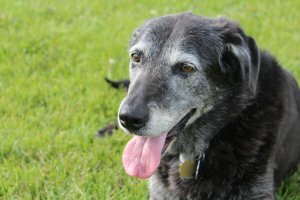 It is important to start small when managing pain in older dogs. You can begin with weight loss then move on to adding in supplements like fish oil and if that isn’t enough then you can escalate to treatment with NSAIDs or Tramadol. It is important to consult with your veterinarian to find the best pain management method for your dog. Contact the Animal Medical Center of Streetsboro today to learn more about pain management options for your pet. ← I Just Adopted a New Dog – What Should I Expect for My First Visit?